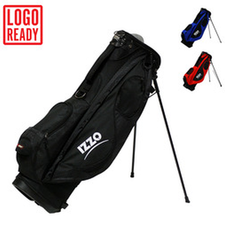 IZZO Golf Black Neo Stand Bag - (Full Length Dividers) - $89.95 - GolfersEdgeOnline.com - Best Golf Equipment On The Web! The ultra-light NEO Stand Bag weighs only 4.9 lbs and leverages IZZO’s original Dual Strap technology – combining our Comfort Swivel™ design with a patented “rotater” connection – that renders the NEO extremely comfortable and easy to carry. This unique carrying system – only available from IZZO- creates extra slack and flexibility in the strap to alleviate constraints when reaching back to apply the left shoulder strap. Easy On, Easy Off, Easy to Carry! The NEO also features a 7-way organizational top with full-length dividers for maximum club protection and offers ample storage via 5 pockets. Including a full-length apparel pocket, valuables pocket and insulated water bottle pouch. Other convenient features include a towel ring, velcro “glovekeeper”, umbrella tie, and rain hood. If you have any more questions about the IZZO Golf Black Neo Stand Bag - (Full Length Dividers); do not see the model you are looking for; need custom options; or prefer to not purchase online, then please call us at (630) 656-1291.